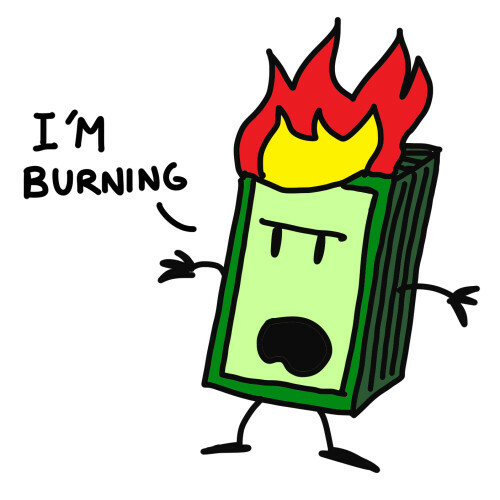 Your burn rate is the speed at which your cash balance is going down. If you had $1mm in cash on January 1st, and now it is October 1st and you have $250,000 left, your burn rate is $750,000/9, or $83,333/month. Just to be perfectly clear the $750,000 in this calculation is the amount of cash that has gone out the door ($1mm minus $250,000 is $750,000). And the 9 is the number of months that have transpired (January through September is nine months). So it is October 1st and you have $250,000 left and your burn rate is $83,333/month. So how many months of cash do you have left? Well now that you know your burn rate, that’s easy. Take the amount of cash you have left ($250,000) and divide by your burn rate ($83,333/month) and you get three months. At year end, you will be out of money. That’s the whole point of knowing what your burn rate. If you had unlimited funds, burn rate would be an irrelevant number. But I’ve never seen a company wtih unlimited cash. So entrepreneurs, CEOs, and certainly CFOs should always know how much cash they have and if they are burning cash, they should know the rate at which their cash balance is going down. And of course, they should know the date on which they will have no cash left. If your company is highly profitable and spitting cash (like Apple), then this whole issue is not as important. But companies can go from profits to losses pretty quickly, because of a bad economy or a product cycle transition or some other bad fortune. And when that happens, burn rate can become important very quickly. So having a sense of cash balance and expense structure is always a good idea. The calculation of burn rate above is what I call the “back of the envelope method”. You can do that in a board meeting, a pitch meeting, or in a car driving down the highway (which I did last tuesday) as long as you have two dates in time and cash balances on both dates (assuming there has not been a financing in between). But there is a more sophisticated way to calculate burn rate. You look at your monthly expenses on your income statement. Add all of them up. And then look at any outlays of cash for capital expenditures or other regular uses of cash on the balance sheet and cash flow statement. Add all of these monthly cash outlays together. This is “gross burn rate”. Then you look at revenues, or even better cash reciepts from revenues. Include all incoming cash you are certain you can count on every month. Subtract this from gross burn and you get “net burn rate”. This should be the amount of cash that your business is burning in any given month. Whenever I get a version of this more sophisticated calculation of burn rate, I always do a sanity check by comparing to the “back of the envelope” method just to be sure they are in the same ballpark. If a CFO reports to the board that the Companny has a net burn rate of $100,000/month, but the cash balance has gone down by $1mm in the past five months, it’s a signal that something’s not right. And then you have to dig deeper. When you do these “deeper dives” you often run into “one time expenses”. “Well, we had to lay out a huge security deposit in February that was a big hit to cash” or “our legal fees on the big contract with IBM were a big hit to cash in June”. But my view is if a company has big “one time expenses” every month or two, they really aren’t one time expenses. The burn rate calculation needs an accrual for these sorts of things in it. Burn rates can change pretty quickly. If revenues are ramping faster than expenses consistently month after month, the burn rate will go down. And for good reason – the company is getting closer to making money, which is what all this stuff is about at the end of the day. Burn rates can also go in the other direction if expenses are ramping faster than revenues or if there are no revenues. Burn rate calculations need to take into account the fact that burn rates aren’t constant. If your burn rate is going up, from $83,333 per month to $100,000 per month, then the $250,000 you have left will not last three more months. It might only last 2 1/2 months. Assuming a constant burn rate can be very dangerous. Always know if your burn rate is going up or down and include that fact in your analysis. Most startups burn money for a time. Some for only a very short time. But many for a longer period of time. During that period of cash consumption, it is critcal to keep a close eye on cash balance and burn rate and cash out date. It will tell you when you need to raise money again (at least six months before you run out of cash please!). And it will tell you how much you are investing on a monthly basis on your company. These are important numbers to know, to internalize, and to operate with. Graph your runway. Graph your runway rate of change. Every month, every projection, every pivot, every hire. Lines don’t lie like numbers can. Runway lines accelerating towards zero are an awful thing to stare at and are very likely to induce change before it’s too late. Does sharing burn/runway with employees correlate to more alignment & motivation or more calls to recruiters? I’m firmly in the alignment and motivation camp, at least in early stage. If you’re at three people and you can’t share your runway length for fear of losing them, you’ve hired the wrong people. That really breeds a sense of shared responsibility. It’s “our” plan instead of your plan. This article was originally written by Fred Wilson on December 5, 2011 here. Next post Burn Rates: How Much?